Keeping your home cool during summer can be a struggle for any homeowner throughout Queensland. Your ceiling alone accounts for 25% – 35% of heat gains inside your home during summer. Avoid using air conditioning one evening and before you go to bed, step outside and feel how cool it is outside, then step back inside your home. You’ll likely discover it’s warmer inside your home, than out. That’s because heat as high as 70°C is trapped in your roof space. That heat slowly penetrates your ceiling and heats up your house. Each spring, the ongoing battle with air conditioning to keep your house cool starts again. However, in many instances, you may simply be wasting money trying to cool down a house that desperately needs roof ventilation, not constant air conditioning. How do I address the hot roof space issue? Many homeowners turn to insulation to control the amount of heat that penetrates the ceiling from their roof space. Insulation slows down the penetration, but it doesn’t stop it. 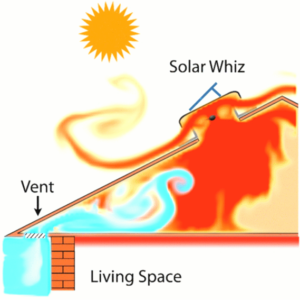 They may find that without ventilation, insulation acts as a heat trap, or a sponge. Others turn to passive ventilation, or roof whirlybirds to allow heat to be exhausted from their roof space. Whirlybirds in principle are great, but their patented design concept is over a century old and modern alternatives are offering tenfold higher airflow capacities. One dedicated active-powered roof ventilator (think solar ventilators or mains powered roof ventilators) can perform up to 40× better than a standard domestic roof whirlybird. On top of this immense heat extraction capacity, a roof ventilator can also reduce moisture & condensation levels in your roof space – and even if your house if installed correctly. This is especially important to prevent mould colonies from growing and avoid structural rot in your roof-space! Remember, any roof ventilation is only effective if replacement air for the extracted warm and/or moist air is available. It’s important to note that roof ventilation doesn’t replace an air-conditioner, but it’s immensely helpful in keeping a home cooler and reducing the cost of air-conditioning. If you’re serious about bringing down your energy costs for air conditioning, or simply want a more comfortable, fresher and drier home, consider seeing a roof ventilation specialist at the Brisbane Home Show!